FHTBA is in the process of creating the team schedules. Your child's coach will provide you with a schedule at the first game. Saturday games start at 9:00 a.m. 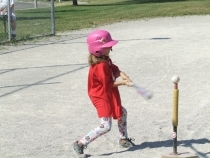 Junior T-Ball games are played on Tuesday and Thursday. Intermediate T-Ball games are played on Wednesday and Saturday. Senior T-Ball games are played on Wednesday and Saturday.